Members may access various functions in ClubRunner depending on the Access Level assigned to them. Access levels range from 90 (no access) to 30 (access to all functions). Access Levels are often assigned based on the member’s role within the club, but this may vary according to individual. 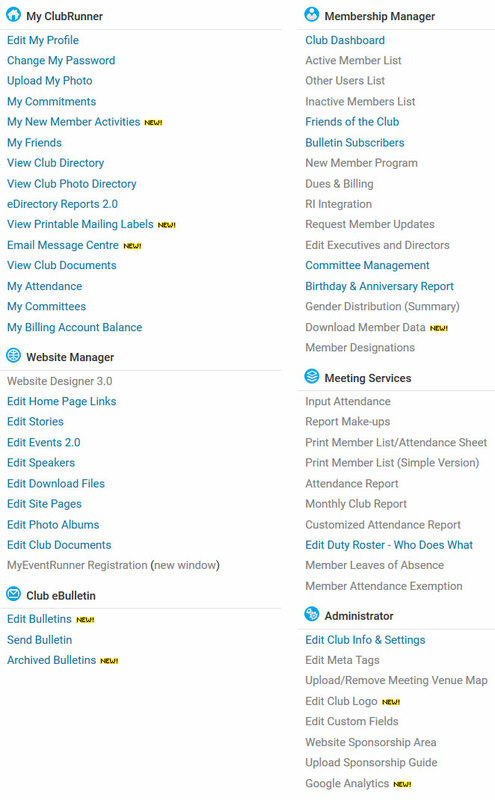 For example, an otherwise ordinary member serving as web master for your club site may require a higher access level than your club president or executives. Listed below are typical access levels for members of various types. Click here to jump directly to Changing a Member’s Access Level. 40 Club President - This is reserved for the current year president. This gives access to everything except for changing the website. 50 Club Executive - This is for Club Executives and Directors. This gives access to everything except for changing the website. 60 Editor - This is for members who would like to write stories, create the bulletin, and events. 70 Member - This is the default access. This lets members edit their own profiles, send email, pay invoices, and view the club directory. 80 Restricted Member - This restricts the member from sending emails. 90 No Access - This will not let the member login. NOTE: Your Club website access level have no relation to your access levels on your District’s website. District website access is determined separately according to your executive position at the District level. In other words, even if you are a Club site administrator or president, your District level access may be much lower. The screenshots below demonstrate the functions available through each access level. If a given tool is grayed out, it cannot be used at that access level. No access to admin screens. 1. Login to your ClubRunner website. Once you have accessed the site, click on the Membership tab. 2. Next, click on the Member Lists link. 3. This opens a list of your current members. Click on the name of the member whose access level you wish to change. 4. Click on the Settings tab in the member's profile. 5. To change the member access level, click the Edit button. 6. Use the Club Access Level drop down menu to select the desired access level. Note: You can only increase someones access level to the same level as your own. For example as a level 50 Club executive you cannot make someone a level 40 President, or level 30 Site Administrator. How do I use the Bulletin Archive? How do I transfer a member to my club?